Please click here to go directly to our Profits Interest article in PDF. Facilitates equity transfer with greatly reduced costs and taxes. Can be paired with other equity based tools for a custom-designed plan. Encourages growth, succession and the founders' mentality. Profits interests are a unique solution to ownership and incentive planning available under current US tax law. Properly designed, profits interests convey an ownership share of future profits and equity upside without a capital stake in the past. This powerful incentive plan requires no buy-in; is not taxable at grant or vesting; and, its capital liquidations are taxed as capital gains. More importantly, profits interests satisfy the very essence of high performance incentives. They bolster performance by rewarding achievement. They facilitate leadership and owner succession via equity transfer. They grow human capital by attracting new talent and retaining key employees. And they strengthen high-performance cultures by promoting equity and fairness. As powerful a tool as profits interests can be, there also are implications, complexities, and costs attached to their use that owners and their advisors need to consider. Profits interest is a cantilevered approach to equity transfer. Profits interests extend a stake in the economic future of a company without requiring payment for the underlying capital interest foundation. Encouraging key executives to feel and act like co-owners in a privately held business is the holy grail of executive compensation planning. Nevertheless, many owners of partnerships, and their trusted advisors as well, are unfamiliar with one of the most powerful and flexible tools that US tax law currently allows for achieving that goal. This tool, which is available exclusively to LLCs taxed as partnerships and other partnerships, is the profits interest. The profits interest enables owners to give key employees a stake in the future of a partnership without simultaneously transferring any portion of the underlying value of the firm. The grant of a profits interest has a distinguishing feature in current US tax law: It is a transfer of true equity without the typical buy-in or tax friction associated with most equity transfers. Among other things, a profits interest must be granted based on or above the then fair market value of the partnership, generally referred to as the threshold value, notionally similar to a strike price for a stock option. The threshold value is the signature characteristic of a profits interest: if the partnership was liquidated the moment after a profits interest is granted, then the profits interest has no value. Thus, unlike many other kinds of executive incentive plans, the grant of a profits interest requires no buy-in, carries no immediate tax consequence and qualifies for capital gain treatment at liquidation or sale if held for the required time period. 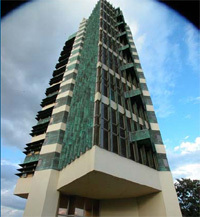 To borrow a concept from architectural engineering, the profits interest is a cantilevered approach to equity transfer. Architects design awe-inspiring buildings, like Frank Lloyd Wright's Fallingwater, by cantilevering a portion of the superstructure into space without visible means of support. Similarly, profits interests extend a stake in the economic future of a company without requiring payment for the underlying capital interest foundation. The profits interest is a powerful type of strategic incentive limited by choice of entity. C corporations and S corporations, the historical choice for middle market entities, are not permitted to use profits interests. As middle market LLCs and partnerships rise in popularity, profits interests are becoming a mainstream choice as a strategic incentive. (see Sidebar "More partnerships, more profits interests"). If the current trend continues, within a decade, partnerships, particularly LLCs are likely to be the predominant structure in middle-market businesses that range from $25 million to $1 billion in revenue. The upshot:The demand for and use of profits interests among middle-market companies is in its early stages and likely to increase rapidly for years to come, subject to changes in US tax law. The growth of pass-thru entities has triggered the growth of partnerships. Pass-thru entities have a fundamental advantage over C corporations. Pass-thru entities pay only one level of tax. C corporations can "check a box" and elect to be taxed as a pass-thru S corporation. Conversely, it is unusual for a corporation to convert to a partnership because doing so generally results in a taxable liquidation of the corporation. Accordingly, LLCs are typically natively formed, or "born", as partnerships. LLCs taxed as a partnership also avoid many of the restrictions of S corporations, such as single class of stock, pro-rata distributions in accordance with stock ownership, the number and nationalities of owners, financing structure, and administrative requirements. That is why, starting in the late 1990s, more and more owners of new companies began to choose the more-flexible LLC structure over the S corporation. Three characteristics can make profits interests a superior, high-performance incentive for partnerships. Specifically, profits interests are accretive, they are taxed as property and they are especially flexible. Taken together, profits interests can be especially effective tools for achieving the "jobs-to-be-done" in middle-market partnerships. The value of a profits interest accrues from the future success of the business. It has no value when issued; its monetary value is generated only after it is granted—when profits and upside equity value are allocated. Hence, owners and founders can be assured that they are only giving away a portion of the upside growth of their companies. When designed correctly, a profits interest creates added value for both the underlying capital-interest founders and new profits-interest owners. There must be no guarantee of income from the profits interest. In other words, a profits interest cannot relate to a substantially certain and predictable stream of income. The recipient may not dispose of profits interest within two years of receipt. 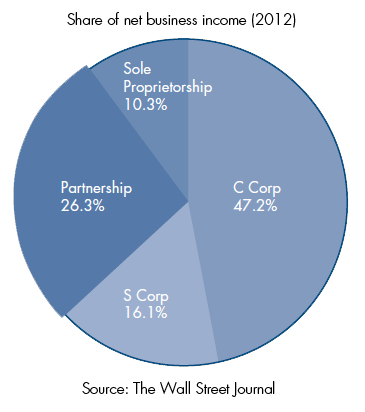 The profits interest must pertain to a privately-held partnership. The recipient of the profits interest must provide services to, or for the benefit of, the partnership, as a partner or in anticipation of becoming a partner. All profits interests are composed of two parts: an annual profit allocation and a liquidation value. Because a profits interest need not be granted on a pro-rata basis, owners can create customized distribution waterfalls. Because a profits interest has no financial value when issued, it also requires no investment on the part of the recipient. This means it is well-suited for situations in which a capital investment by key talent is not warranted or not possible. It also means that, if a profits interest is vested on receipt, it is not a taxable event in the eyes of the IRS (Rev. Proc. 2001-43) and an 83(b) election may not be required (though many tax practitioners still recommend the 83(b) as a protective measure). If owners choose to subject a profits interest grant to vesting, a zero-cost 83(b) election can be used to hold the threshold value over a period of years, thereby creating a highly effective plan to attract, retain, and motivate key talent. As long as qualifying conditions are met, the IRS treats a profits interest as property taxable at capital gains rates2 (see Sidebar "Profits interests qualifications"). When designed and directed properly, the recipient pays no tax at grant (as long as granted at or above the threshold value), no tax at vesting, and no ordinary income taxation upon the liquidation event. In these regards, the profits interest is a truly unique tax vehicle in the realm of executive compensation and incentives. The unusually large degree of choice in the design of a profits interest makes them powerful tools for shaping the value-sharing curve3 of partnerships. All profits interests are composed of two parts: an annual profit allocation and a liquidation value that is distributable upon an eventual separation of service, sale of the business, or some other redemption event. The specifics of a profits interest grant can be customized in a variety of ways that best suit the needs of founding partners with regards to gainsharing with key employees, owner succession and preserving wealth. For instance, the award of the profits interest can be passive and non-voting or can provide "owner power" including the specific rights and privileges of the recipient in voting and access to corporate books and records. A profits interest can be granted outright or vested based on time, personal performance and/or business performance. The gainsharing value components of a profits interest, such as share of annual profit allocation and liquidation value, can be custom designed. And its payout—ranging from installments to a lump sum, for example—can also be specified and modified. Because a profits interest need not be granted on a pro-rata basis, owners also can create customized distribution waterfalls. For example, a founder contemplating a future sale of his or her company could specify the allocation plan and distribution waterfall of profits interests to ensure that key executives receive a portion of the proceeds of the sale starting and ending at specific levels—perhaps reserving an initial portion of the proceeds for family and general partners, then including key executives up to a maximum amount, and directing proceeds above that amount back to family and founding partners. Exhibit 1 illustrates the versatility of profits interests. Scenario 1 shows a basic, plain-vanilla profits interest—by far, the most common flavor. It grants the recipient a 10 percent allocation of annual profit of a partnership and a liquidation value of 10 percent of the company value in excess of the $100 million threshold value of the company established at grant. Scenario 2 shows a two-tiered profits interest—something an owner might design to create greater motivation, reward long-term service or reposition incentives for a strategic sale. 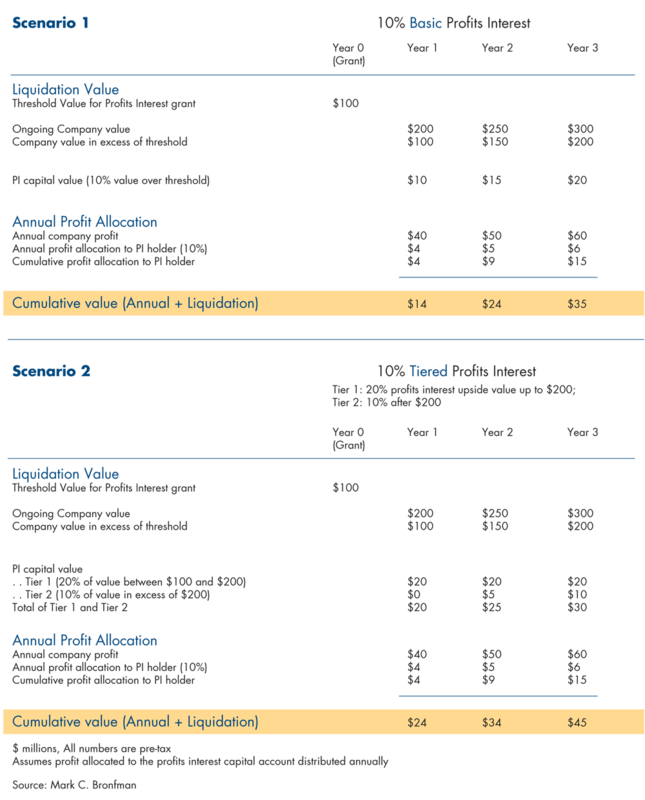 In scenario 2, the recipient is granted a 10 percent allocation of annual profit (same as scenario 1), while the liquidation value is tiered to be 20 percent above the threshold value up to a cap of $200 million with a second-tier of liquidation value at 10 percent for company value above $200 million. The result: at a liquidation-triggering event at or above $200 million, the recipient effectively catches up to own 10 percent of the overall company fair market value without any upfront tax or buy-in friction associated with the transfer of a capital interest. Results in a significant incentive by giving these candidates the "owner experience" without the typical friction and complexity of traditional capital interests. If owners feel that a skin-in-the-game buy-in is essential, they can combine a profits interest with a capital interest to create an integrated security that we have custom-designed called a hybrid interest. Profits interests help middle-market companies attract talented people—a prerequisite for owners who are striving to jump the "S-Curve" of predictable growth by building a leadership team capable of achieving consistent high-performance.5 Middle-market companies often recruit seasoned professionals from more established organizations, who might perceive a job offer as a lateral move or a step down on the career ladder. Moreover, partnerships often grow via "tuck-in" acquisitions that bring new high-potentials into the fold (when, for instance, an architecture firm acquires a smaller firm or a preexisting practice from a larger firm). Profits interests are an effective tool for doing both jobs because they enable owners to offer key hires an equity stake in future growth without requiring a buy-in. This results in a significant incentive by giving these candidates the "owner experience" without the typical friction and complexity of traditional capital interests. Profits interests simplify ownership succession by significantly lowering the associated tax burden. If so written, the liquidation value of a profits interest can be converted to a share of capital interests representing full, pro-rata ownership in the firm. Profits interests also can work as part of a management buyout, recapitalization or redemption strategy. This process can, with the right fact pattern and planning, eliminate an entire level of taxation from the traditional succession transfer process. Holistic planning including profits interests can be used to facilitate an efficient transfer of ownership in family businesses to the next generation as well. The profits interest can help a company strengthen its financials in the eyes of potential acquirers. Profits interests can be used to reposition some at-risk executive bonus incentives from "compensation" to owner distributions, thereby increasing stated EBITDA. Further, by granting key executives a stake in the anticipated future profits in lieu of salary or bonuses, growth-story companies may be able to reduce their fixed compensation costs, preserving and amassing much-needed cash to fuel growth. Finally, since properly structured profits interests qualify for capital gains treatment, they can be a more powerful incentive than traditional stock options or restricted units for key executives who are helping to prepare a business for an eventual strategic sale. The fact that profits interests are granted without cost to key executives can be blessing and a potential curse. Sometimes the only way to know if an executive has "bought in" culturally is to find out if he or she is willing to "buy in" financially. Further, once an executive dips into their pocket to buy in, he or she may be more motivated to protect that investment and more watchful of excessive risk, such as an expensive acquisition. While pro ts interests and synthetic equity are both powerful incentive tools, they are very different in regard to design, ownership and taxation. Profits interests are property and, as such, the operating agreement specifies the "buy-sell" terms meaning what specifically happens in any triggering payout event such change in control, separation of service, retirement, termination for cause, and death/disability. Profits interests represent a transfer of true equity and, accordingly, profits-interest partners are true partners. Thus, the set-up and maintenance costs of profits interests can be relatively high compared with off-the-shelf, synthetic-equity incentive plans. Profits Interests are property and, as such, the operating agreement specifies the "buy-sell" terms, meaning what specifically happens in any triggering payout event such change in control, separation of service, retirement, termination for cause, and death/disability. The holder of a majority interest in the partnership generally owes a fiduciary duty to the all owners/partners, including profits interest partners. A profits interest requires a determination of a threshold value of the company, which typically means a third-party valuation. Because there are few prototype profits interest plans, drafting a profits interest often requires customized legal documentation. Because the recipient of a profits interest must be treated as a true partner, the recipient should, among other things, pay estimated taxes on guaranteed payments and self-employment taxes, pay for certain corporate benefits, receive a K-1, and file taxes in each state that the partnership operates— costs typically borne by the partnership. Further, consistent with all true equity plans, the redemption of profits interests is not tax deductible by the company (a reason why synthetic equity is a very viable strategic-incentive alternative for LLCs). Some of these implementation costs can be mitigated by using an experienced team of value architecture professionals. Still, we expect the smallest middle-market companies may not wish to shoulder the cost of implementing profits interests. Some private equity and hedge funds have been scrutinized for using a certain type of profits interest called carried interest to reposition a portion of their periodic fee compensation as long-term capital gains. Congress and the IRS have publicly considered taking exception to this use—claiming that, among other things, some private equity or hedge funds have exchanged predictable fee income for profits interests that are ineligible under the safe harbor rules. We anticipate that profits interests that fail to meet the safe harbor rules (see profits interest qualifications sidebar earlier in this paper) will be treated as compensation, not as property. Congress and the IRS could also eliminate the profits interest safe harbor altogether, but that does not appears to be very likely. Is the profits interest the right solution for your organization? The profits interest is a truly unique strategic incentive for middle-market companies. From a tax and incentive perspective, few structures can match its versatility and benefits. Still, given the implementation considerations, profits interests are certainly not for everyone. Owners and their advisors need to understand when and how to put this powerful tool to work in concert with other candidate executive incentive strategies. 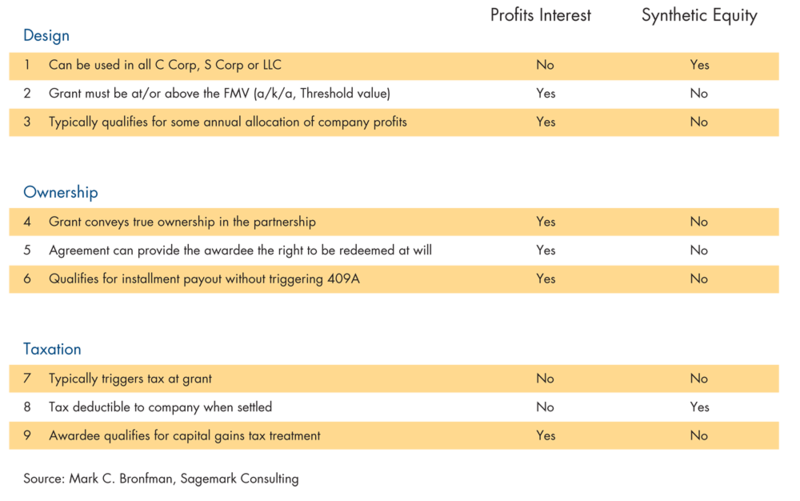 We expect profits interests to become increasingly popular as many more middle market companies choose to be structured as an LLC taxed as a partnership. Designed properly, profits interests offer many advantages. They can bolster business performance—by rewarding achievements and fostering a founder’s mentality in key executives. They can facilitate business continuity and control—by promoting leadership succession, enabling the amassing and transfer of capital, and expanding owner optionality. They can enhance human capital—by attracting new talent and retaining key employees. They can strengthen high-performance cultures—by nurturing meritocracies and promoting equity and fairness. Indeed, the profits interest is a powerful and dynamic tool for incentive planning in middle-market partnerships. 1 Richard Ruben, "Knotted-Up Tax Systems Make an Overhaul So Tricky" The Wall Street Journal, Feb. 8, 2016. 2 In some cases, a part of the capital gain is re-characterized as ordinary income if the partner is selling a share of so-called hot assets such as unrealized receivables, inventory or fixed assets where there is depreciation recapture.